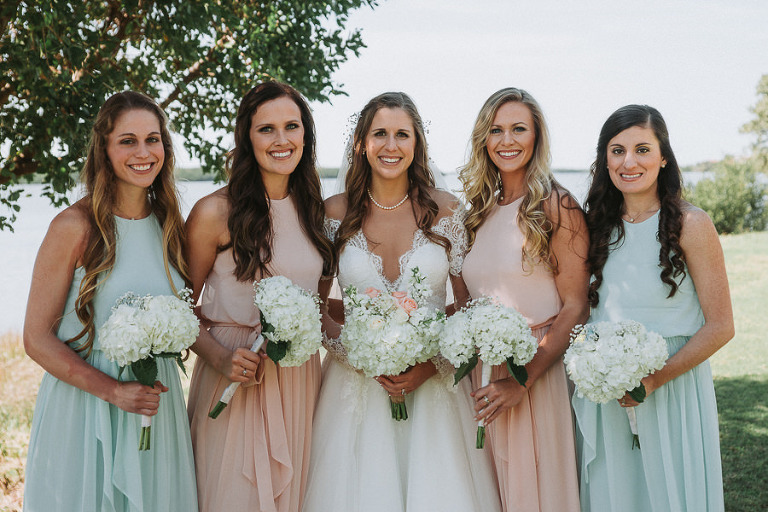 Jane and Daniel’s waterfront St. Petersburg wedding featured an elegant but casual theme, with an emphasis on the natural color palette of the beautiful scenery of Tampa Bay. “We wanted our guests to be able to enjoy the sunset and the evening outside in a casual setting, but we still wanted it to feel like a fancy wedding. We compromised with the casual yard games and S’mores outside, while the inside was a bit more sophisticated and classy,” the bride explained. 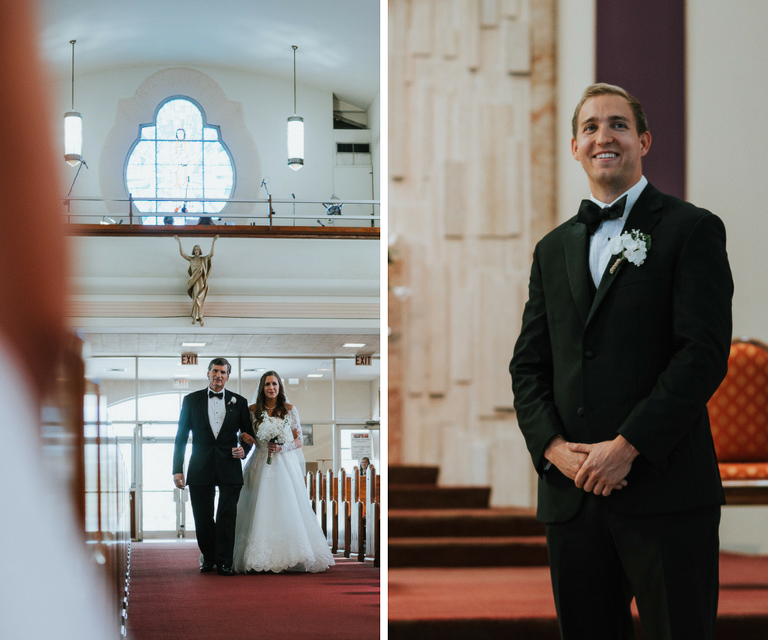 To capture all of the special memories from their wedding day, the couple hired Tampa wedding photographer Grind & Press Photography. We wanted our guests to be able to enjoy the sunset and the evening outside in a casual setting, but we still wanted it to feel like a fancy wedding. We compromised with the casual yard games and S’mores outside, while the inside was a bit more sophisticated and classy. In my head I was picturing pale pinks and blues as my colors. My wedding planner suggested tying that into the sunset, which was perfect, and the sky ended up being a beautiful blue and pink that night at sunset. I wanted our wedding photos to look natural and not super posed. I also wanted someone I felt like I could be totally natural in front of. Ashley was definitely the best choice! Ashley was super flexible with shooting time, and she made it work within our budget. She was amazing, so down to earth and her turn around of over 1,000 photos was so fast! Being able to capture the sunset was another thing we really looked for and Ashley nailed that as well. Lauren and James’ waterfront destination Clearwater wedding featured an ivory, rose gold and navy color palette with an elegant ocean inspired theme. The important must haves on the bride’s list: cake, flowers and of course, sunset photos! “We chose Clearwater because we both love it there! 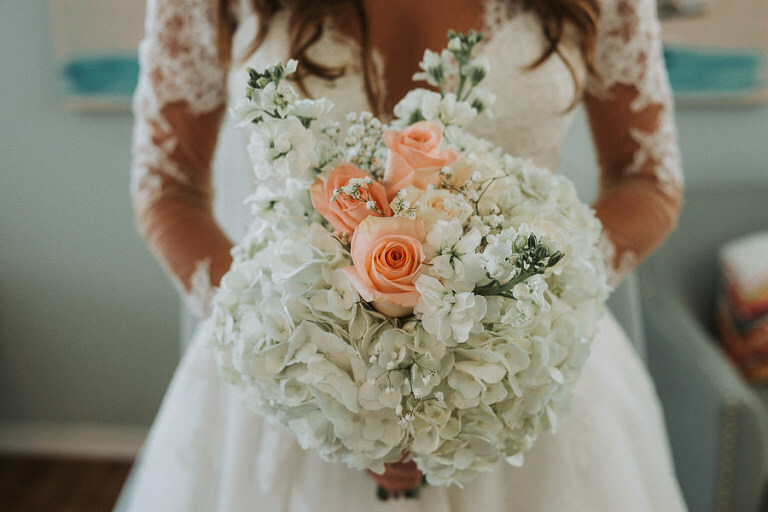 I am blessed to have moved back to Ohio and for us to have made a family, but my soul belongs in Florida, so we couldn’t think of any place better to get married,” the bride gushed. The Cincinnati couple searched for a unique Clearwater wedding venue that would wow their guests and provide an intimate and relaxing atmosphere. Searching for a cake that would be a work of art, the bride hired Tampa Bay wedding cake designer, The Artistic Whisk, to create a dessert that impressed not only in look, but also in flavor. Looking back, the bride had many memorable moments thinking of loved ones past and present who helped the couple get to their special day. Something our guests would love and continue to talk about and that went with our theme and encompassed the great things about Florida: the water and sunsets. The Yacht StarShip was absolutely amazing! The staff were professional and top quality. 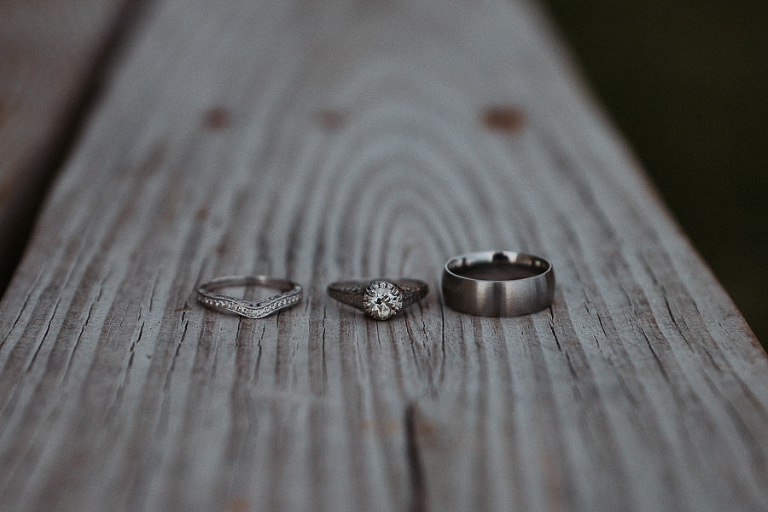 They offered so much and truly catered to the bride. Christine, my wedding planner, was more than exceptional! James proposed on the beach in Indian Shores, Florida, where we were on vacation. He wrote, “Will U Marry Me?” in the sand, got down on one knee and proposed! Ocean inspired elegance. Florida is apart of our past, and my soul belongs in Florida; someday I will move back. Ivory, rose gold and navy. The colors look very elegant. Art! I wanted the cake to be so beautiful that you didn’t want to touch it and, of course, be delicious too. The Artistic Whisk uses ingredients that are all natural, and the owner, Jovana, was beyond wonderful. She is the sweetest person ever! I gave her full creativity design on our cake. I loved all her work and had a hard time designing a cake myself, so I told her to surprise me. She did not disappoint either. I cried when I saw it!